If you thought Elon Musk (or as we like to call him in these quarters “Elon da Vinci”) was a dead man walking, you were wrong. Like Wile E. Coyote in the Road Runner cartoon, Musk can fall a thousand times off a thousand cliffs and never die. 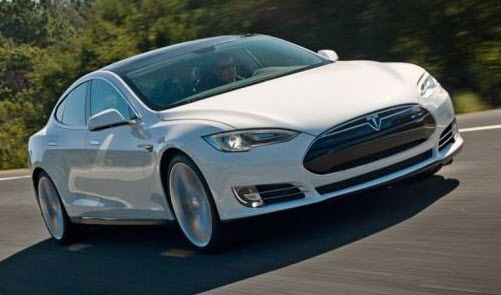 After Tweeting that Tesla (TSLA) had funding to take the company private at $420 back in August, he has since settled charges with the Securities and Exchange Commission (SEC) for misleading investors. Musk agreed to pay a $20 million fine and relinquish his role as Tesla’s chairman for three years. For perspective, Elon’s net worth hovers around $20 billion, so a $20 million fine is spare pocket change. More importantly, Elon is reborn and emboldened. And his new target is an odd one – index funds. In a series of angry Tweets sent on Oct. 4, Musk blamed the securities lending done by index funds and ETFs with having “no rational basis.” He also claimed it gives short sellers a “strong incentive” to attack publicly traded companies. Moreover, he inaccurately stated that passive indexing accounts for most of the stock market investing done today. In SpaceX terms, Elon has air-lifted into another solar system. While it’s entirely true that index investing has gone mainstream, (heck, there’s even an “Index Investing Show” which I host.) it does not represent “most of the market” as Elon inaccurately claims. 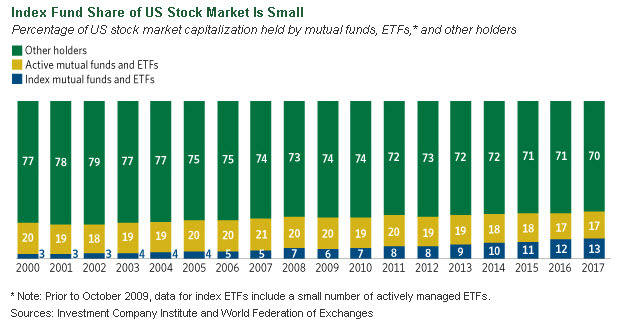 The chart below from the Investment Company Institute shows that index mutual funds along with ETFs own a minority percentage of U.S. stocks by market capitalization. Moreover, it will take yet several years more before the assets held in index funds surpass actively managed mutual funds. According to one estimate, Moody’s Investors Service projects it will take approximately three to six years more before indexing even comes close to overtaking actively managed strategies. Loaning securities from a portfolio to outside investors or speculators in exchange for a fee is a common Wall Street practice that goes back decades. It’s commonplace among mutual funds, pension plans, ETFs, and other entities that hold a large and stable portfolio of securities. Why do they do it? Funds can garner extra income by lending securities to outsiders, who often happen to be short-sellers. These short-sellers make money when the value of the securities they’ve borrowed decrease in value. To lock in gains, they wait for stock prices to fall and buy the stocks back to cover their positions. More often than not, short-selling is an unprofitable exercise for everyone but the securities lender. Although securities lending is widespread, the SEC places limits by mandating the total value of borrowed securities may not surpass one-third of a fund’s total market value. However, many funds and ETFs stay well below this lending threshold. In the ETF market, any revenue gained from securities lending is small even for funds that lend out hundreds of millions of dollars in securities from their portfolios. What is the benefit to fund shareholders from securities lending? The answer ultimately depends on how much of the revenue gets plowed back into the fund. While some ETF providers retain some portion of the revenue derived from securities lending, most firms return 100% of the money. 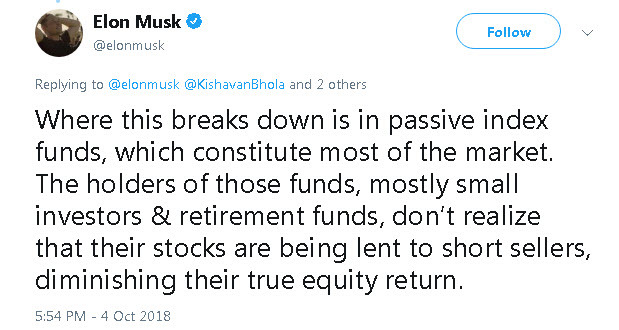 Where Musk is probably right is that most investors don’t realize that index funds and ETFs do engage in share lending. However, this is hardly illegal or nefarious. In fact, reputable fund companies often return all or most of the revenue generated from securities lending. During the summer, Fidelity Investments unveiled a new series of fee-less index funds called the Fidelity Zero Total Market Index Fund (FZROX) and Fidelity Zero International Index Fund (FZILX). Both funds target the U.S. equity and international equity market with a broadly diversified approach. If Fidelity isn’t charging fees on these funds, how is it making money? When pushed to answer the question, suspicions arose that Fidelity might try to make money on the back-end by loaning out the securities held in each of the respective ZERO fee mutual funds. Who Told Elon about Securities Lending? Accusing index funds and ETFs for aiding and abetting short sellers of stock is a stretch. Share lending is incidental to the index fund and ETF business and it’s not illegal. Moreover, short selling allows speculators to express their views about a stock. Any increase in the scrutiny and transparency of corporate practices or behavior can benefit investors. Targeting index funds as co-conspirators with short sellers shows just how far Elon’s paranoias have traveled. Right now he’s in Desperation Land, if such a place even exists. Think about it this way: If Elon was as compulsively obsessed with delivering cars as he is with short sellers, production hiccups at Tesla wouldn’t exist. Going forward, Elon should ignore short-sellers. Isn’t his genius best spent on building a world-class company with innovative products that win over the long-term? 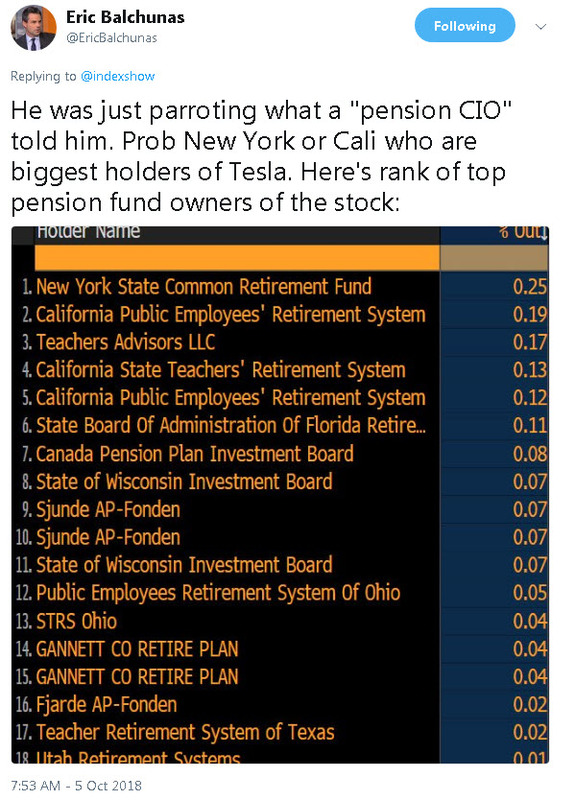 And being the huge underdog that he along with Tesla are, I can’t but help root for him – even if his baseless accusations against index funds are 100% wrong.